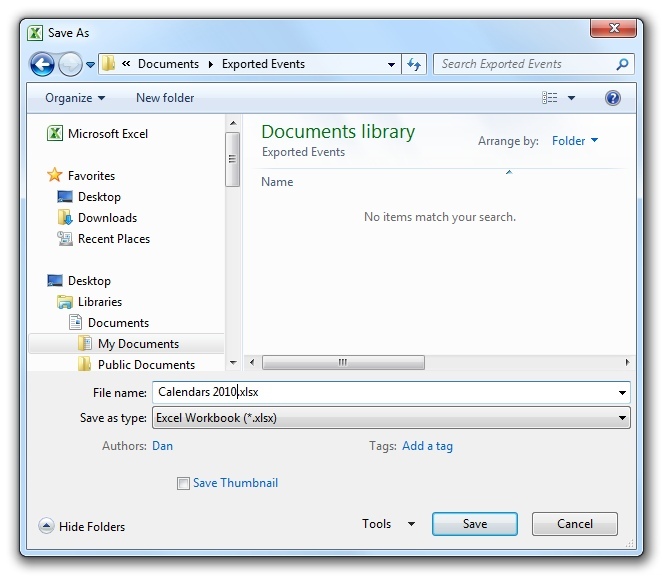 Click the "Export -> Export Events" command the File menu. 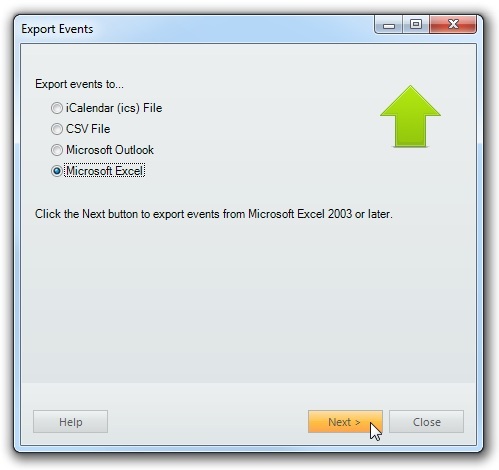 Right-click a calendar in the Calendar List and select the "Export -> Export Events" command. 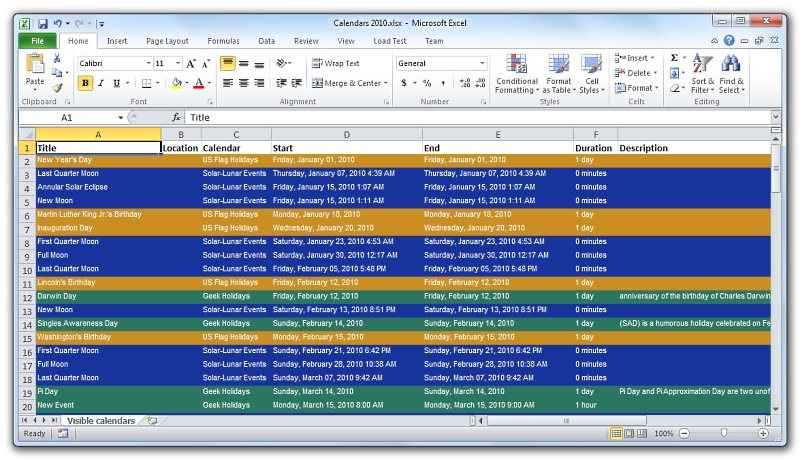 VueMinder can export a selected calendar, or all calendars, to Microsoft Excel. The exported data can be saved as an Excel workbook, or any other file type that Excel is capable of saving to, such as XML, HTML, or plain text. This feature requires Excel 2003 or later. Events belonging to the selected calendar will be exported. If you'd like to export events belonging to all calendars, select the "All calendars" option from the list. Or, to export only those calendars that have checkmarks in the Calendar List, select the "Visible calendars" option. Only events falling within the specified range of dates will be exported. You can specify an automatic date range by selecting an option from the list. You can also choose a custom date range by entering your own start and end dates. 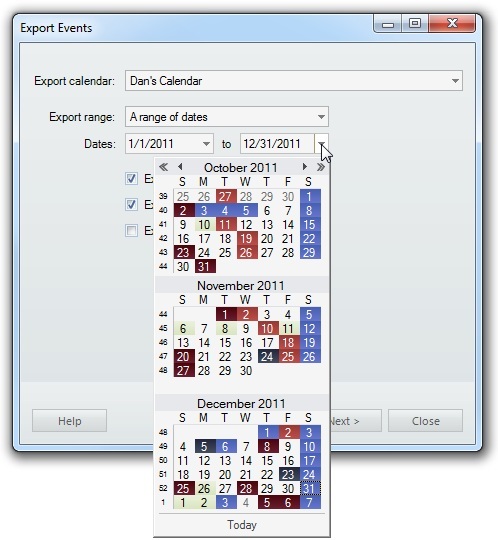 Dates can be typed using the keyboard or selected using the drop-down calendar. You can choose to format the output to match the event appearance settings by checking the "Export event colors" box. Each row will be formatted as closely as possible to the format specified in VueMinder. Note, this will not include secondary background colors or gradient patterns, since these settings are not supported by Excel 2003. If the "Export event appearances" box is unchecked, no colors will be exported. To export event reminder settings, check the "Export reminders" column. For simplicity, the exported reminder data will only include the reminder type and when the reminder should appear. Additional reminder settings, such as music to play or recipient email addresses, is not exported. By default, dates and times will be exported to the same cells (example: "7/6/2011 8:00 AM"). If you prefer the dates to be in columns separate from the times, check the box labeled "Export separate date and time fields". 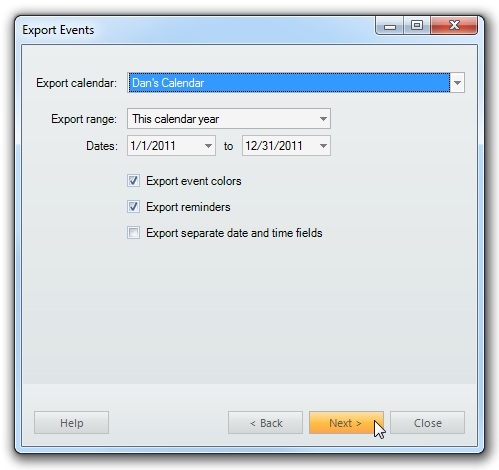 After you've selected a calendar to export and a date range, click the Export button. The export results will update after all the applicable events have been exported. If you have many events, this could take several seconds. When the export is finished, you can click the "Export Another" button to export additional events, or the Close button to close the Export window. 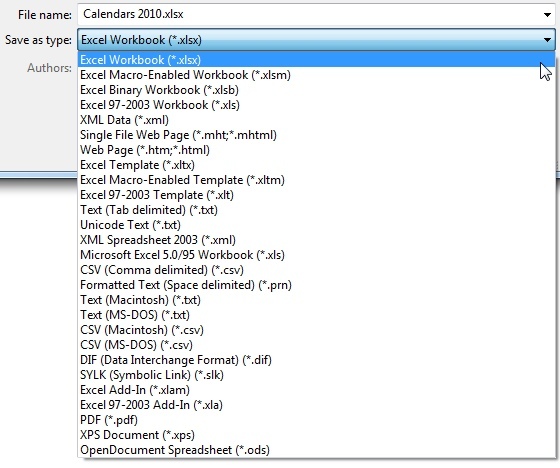 After all events have been exported, the workbook will display in Excel. Note, the exported workbook has not been saved yet. If you'd like to save the exported workbook, you can save it from within Excel, as you normally would for other spreadsheets. You can also save the results to a different file type, such as XML or HTML, by selecting the desired file type from the list. The list of file types may vary depending on your version of Excel. The example below shows the file type options when using Excel 2010. 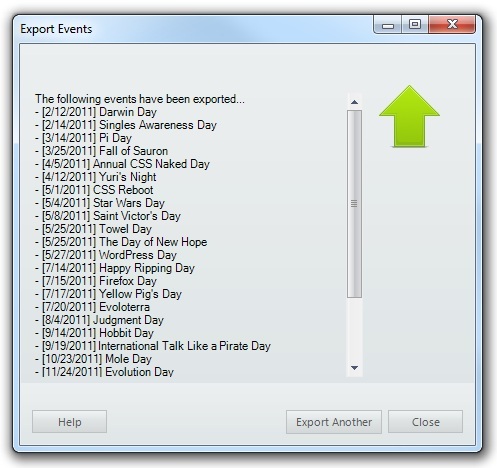 The following screenshot shows an example of exported events when saved to an Excel Workbook.